We’d love your help. Let us know what’s wrong with this preview of The Little House Collection by Laura Ingalls Wilder. To ask other readers questions about The Little House Collection, please sign up. 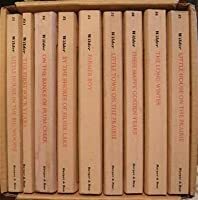 I'm looking to buy a Little house set for my kids and have noticed that there is a set of books 1-5 only and a complete set of books 1-9. Does anyone know why the set of just the first five is more readily available? Were books 6-9 about different characters, or written in a different style? I'm just trying to figure out if I need to go to the extra expense and effort of buying the complete set of 1-9? TIA! 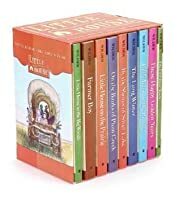 Where can I receive the little house box set? Heather McC I've seen the box set at the occasional used book store (ex. Half Price Books). HPB is a great place to find used and often out of print works. OK, so I'm a little generous with the whole Little House series. Sue me. But for me, as a child, they WERE "amazing," and here's why. When I was in first grade in a tiny, tiny town in Arkansas, and hating school with the heat of a thousand suns, each member of the class was given identical packages at Christmas time. They were books. I'd been reading for a long time already, so loved a new book...but disappointment set in as my classmates who got their books first opened them before I had a chanc OK, so I'm a little generous with the whole Little House series. Sue me. But for me, as a child, they WERE "amazing," and here's why. When I was in first grade in a tiny, tiny town in Arkansas, and hating school with the heat of a thousand suns, each member of the class was given identical packages at Christmas time. They were books. I'd been reading for a long time already, so loved a new book...but disappointment set in as my classmates who got their books first opened them before I had a chance to open mine, and they were all the same: A beginner children's book called "The Big Snow." (I think) It was about a kid getting dressed to go out into the snow. On one page, he put on his pants. On the next page, his boots, and so on and so on, FOR AN ENTIRE BOOK. I wanted to cry. And then when I opened MY book, it was Little House in the Big Woods. Then I DID cry, because it was a REAL book, and somebody "got" me, and knew I was different, and it was OK. I loved the series as a kid, and after reading each book, would spend lots of time imagining that I had brought Laura from her time to mine, and what it would be like to show her things like cars and telephones and televisions--she'd be AMAZED! And she'd think I was so COOL! I read this series when I was in fourth grade...so it was many many years ago. However, the story has not left my mind. I absolutely adored these books, and I'm sure I would love them just as much if I re-read them! I remembered feeling as though I was with Laura's family during every journey they went through. It's a fascinating story - and a true one at that. I'd recommend that everyone reads this series at least once in their life! I read these as a young girl and loved them. That's about all I remembered about them, though. So I decided to read them again, and I'm so glad I did! 1. They are clean and wholesome. 2. They teach responsibility and hard work. 3. They teach about gratitude and being happy with what you have instead of looking elsewhere for happiness. 4. FAMILY is emphasized and taught to be an important part of society. Laura's family is warm, loving, and kind. 5. After reading about all I read these as a young girl and loved them. That's about all I remembered about them, though. So I decided to read them again, and I'm so glad I did! 5. After reading about all of the work that went into obtaining honey, cheese, eggs, grain, meat, oats, and butter, I'm grateful that I can make a quick trip to the grocery store and spend my time doing other things! I enjoyed every character in this series. I especially loved Laura and grew to admire her throughout the series. She always wanted to be outside, enjoying nature. She wasn't big on sitting around for any extended amount of time. She was strong-willed and opinionated, yet well-mannered and feminine when needed. She was a true pioneer and worked hard for everything that she achieved in her life. I also enjoyed the fact that there was a strong father figure in these books, who loved his girls and taught them to work for their dreams. I was annoyed with the fact that he continued to uproot his family, but if he had quit the first time around, and everyone else had, too, then we wouldn't have the good country that we do today. This book isn't politically correct in some places, and it gave me a taste of what it was like to live back then. I'm grateful to be living today, but there are so many things to be learned from these great people! Okay, I'll admit it. I still re-read these. I just finished a ramble though the pioneer prairies with Laura and enjoyed it throughly. I know there is an outcry about the treatment and representation of Native Americans in these books, not to mention women, African Americans, and children. But let's calm our politically correct minds for a moment and think about the treasure of literature these books are. Specifically, they are WONDERFUL for educating young people about how people of color, minor Okay, I'll admit it. I still re-read these. I just finished a ramble though the pioneer prairies with Laura and enjoyed it throughly. I know there is an outcry about the treatment and representation of Native Americans in these books, not to mention women, African Americans, and children. But let's calm our politically correct minds for a moment and think about the treasure of literature these books are. Specifically, they are WONDERFUL for educating young people about how people of color, minorities, women, and children were treated and thought of in the late 1800s. After a couple of days immersed in this series for the first time in I don't know how many years, I'm left bemused in a lot of ways. From a historical standpoint, there's little else out there for kids that is this rich and complete. The everyday details that make up a pioneer life are lovingly dwelt upon in a way that's just far enough removed that even the littlest reader doesn't panic. After all, if they all starved to death in The Long Winter, there wouldn't be a next book, would there? From After a couple of days immersed in this series for the first time in I don't know how many years, I'm left bemused in a lot of ways. From a modern, perhaps revisionist standpoint, I was uncomfortable with the hate that boiled out of Ma every time she talked about Indians. I didn't like the way Pa treated his family, the way he got the most potatoes, the way he dragged them from pillar to post on a whim. So many of the things I didn't like were cultural and I feel as if I haven't any right to not like them, if that makes any sense. It's the way things were then, and ought to be presented as such. Those who don't remember their history and all that. I dig the messages about self-sufficiency, I found the descriptions of how to craft houses and furniture and food out of prairie sod and a few cottonwood trees to be fascinating and useful. Most people love these novels, and I can't for the life of me understand why. I was given the collection growing up and read them, but I never cared much for them and never re-read them. When I was a little girl, my father used to read me these books. It has been a really long time since then and I can hardly remember most of the stories from the book, but I still remember the sense of excitement and adventure in these books. Laura and her family were pioneers, and as a young girl she met each move with a sense of adventure and openness to the world. I also loved that the girl was called Laura like me. These stories are a true testament to the amazing spirit of the pioneers. They kept moving on, dealing with the problems of their life, never losing hope. The parents always did their best to make this world pleasant for their children, and to make times like Christmas magic. Trips to town were a treat when the girls would get a lolly each. They had very little, but completely appreciated what they did have, something which a lot of us have forgotten in our modern consumer driven society. I don't long for those times, because the life was hard and not everyone made it as Laura's family did, but I love the simplicity and teamwork of their little lives. It reminds us to appreciate what we do have. And anyway, they were just such amazing adventures! I think this series is must read material! It's also great for parents to read with their children, creating wonderful memories like the ones I have. I began reading this series in the 4th grade and I think read the last one during my 6th grade or the summer before. I loved back then to read all kinds of stuff but books about history or rural settings just spoke to me. I think even then I was destined to be forever in love with history. I loved the adventurous nature of Pa and Ma Ingalls, products of a time in history when men and women had the pioneering nature that whether right or wrong was the history of the United States. They lived in a I began reading this series in the 4th grade and I think read the last one during my 6th grade or the summer before. I loved back then to read all kinds of stuff but books about history or rural settings just spoke to me. I think even then I was destined to be forever in love with history. I loved the adventurous nature of Pa and Ma Ingalls, products of a time in history when men and women had the pioneering nature that whether right or wrong was the history of the United States. They lived in a generation when many grew up hearing the stories of how their fathers or grandfathers crossed the ocean looking for a better life. About how brave they were. They wanted that same adventure. They were being tempted by a government offering free land and hearing everyone say just go west to the promised land. 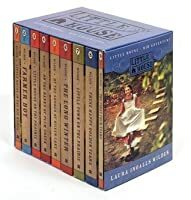 I have, ever since I was 8 and received a box set of the "Little House" books, adored each and every single one of them. In over 20 years, my feelings towards these books haven't changed one iota. They are easy to read, and chock full of information about life as a young pioneer girl. How many times did I wish I could taste Ma's vanity cakes, or see Mary's college dress in person? These books are so fascinating, for anyone remotely interested in history, that it makes it impossible to put them d I have, ever since I was 8 and received a box set of the "Little House" books, adored each and every single one of them. In over 20 years, my feelings towards these books haven't changed one iota. They are easy to read, and chock full of information about life as a young pioneer girl. How many times did I wish I could taste Ma's vanity cakes, or see Mary's college dress in person? These books are so fascinating, for anyone remotely interested in history, that it makes it impossible to put them down. The writing itself is fine. Let us remember that Laura Ingalls Wilder was a teacher in the late 1800's, and that she always received top marks in grammar and reading. Even looking over her books now, as persnickety as I am about poor spelling/grammar/editing, while her language is simplistic, there is nothing wrong with the way she writes. I started reading this set to my school kids. We are on the second book. These books are timeless and the kids love them. When I pulled out Little House in the Big Woods and told them it was our next storytime book, I got waving hands and big smiles. They said things like, "I love those books," and "Those are my favorite books." When I travel on book tours, I prefer home hospitality rather than staying in a hotel. Hotels are lonely, they require me to leave at a specific time, and they don’t have kitchens stocked with all sorts of tasty snacks. The homes I stay at typically put me up in a guest bedroom that previously belonged to a child who has since left the nest. Often the child’s books are still there. On my recent book tour in Florida, I spent the night in my host's daughter's bedroom where I saw Little House on the When I travel on book tours, I prefer home hospitality rather than staying in a hotel. Hotels are lonely, they require me to leave at a specific time, and they don’t have kitchens stocked with all sorts of tasty snacks. The homes I stay at typically put me up in a guest bedroom that previously belonged to a child who has since left the nest. Often the child’s books are still there. On my recent book tour in Florida, I spent the night in my host's daughter's bedroom where I saw Little House on the Prairie on the bookshelf. I loved Laura Ingalls Wilder’s semi-autobiographical historical novels when I was young, so I picked it up, started reading, and ended up finishing it. Reading one of my childhood favorites as an adult was so intriguing that I decided to re-read the entire "Little House" series. Amazingly, I think they stand up pretty well 70 years later. I absolutely ADORED these books as a little girl. I just finished revisiting each book in the series, and I think I enjoyed them even more as an adult. It's a wonderful look at American life in the Midwest as the first pioneers settled in what was then unknown territory. I loved hearing about their adventures as they traveled from one new settlement to another, and of all they overcame along the way. It's nearly impossible not to fall in love with the Ingalls family, who are each filled with suc I absolutely ADORED these books as a little girl. I just finished revisiting each book in the series, and I think I enjoyed them even more as an adult. It's a wonderful look at American life in the Midwest as the first pioneers settled in what was then unknown territory. I loved hearing about their adventures as they traveled from one new settlement to another, and of all they overcame along the way. It's nearly impossible not to fall in love with the Ingalls family, who are each filled with such optimism, strength and spirit. Of course, as an adult, some things struck me a bit differently than as a child. As much as I still adored Pa for his sense of adventure and obvious love of his family, I did question some of his decisions as he risked his family's lives moving them to one new location after another. The descriptions of "the Indians" also made me cringe a little, especially in Little House on the Prairie. I had to remind myself that those were the times; that the new settlers feared Native Americans, and Native Americans feared the new settlers. Pa does remind his family that "the Indians" are just the same as anyone else and that they only want to be treated fairly and given rights to their land. There is also a sense of compassion for them as they are later driven from their territory. Still, it all made me a bit uncomfortable. As did some of the stuff on women's rights, such as when Laura tells Almanzo she doesn't feel women should be given the right to vote. But again, this was the late 1800s. Things were quite different then. I used to listen to these books as my mother read them. My mother got them as a child they kept their gifts in the attic inside their pillow case. My mother snuck up into the attic every night to read her books she had not received yet. She loved them and still reads them to her children to this day. The books themselves are well put together have pencil drawing and explain a lot about the early american heading south. Laura is wonderful at describing the suroundings as she moves through the sta I used to listen to these books as my mother read them. My mother got them as a child they kept their gifts in the attic inside their pillow case. My mother snuck up into the attic every night to read her books she had not received yet. She loved them and still reads them to her children to this day. The books themselves are well put together have pencil drawing and explain a lot about the early american heading south. Laura is wonderful at describing the suroundings as she moves through the states. Her sister became blind and she described the world to her. Her sister became independent and went to a school for the blind. She was even able to ride horses to her home on her own. Even after Laura grew up she tells her life all the way through until the point that she got a treasure. Paper! Her daughter also grew on her mothers passion for writing and started writing books also of her childhood. I finished this serial a long time ago when I was in the elementary school! Back then, I didn't really care if the plot or writings were good or not. I do remember the translation were bit confusing. This is part of my childhood, a very personal one for me. Laura Ingalls accompanied me through some hard times and good times when I was a kid. Like a friend that I ran to to when I needed to hide from the world. I hated Nellie Oleson with her, grieved when they lost their baby brother, trapped in the I finished this serial a long time ago when I was in the elementary school! I hated Nellie Oleson with her, grieved when they lost their baby brother, trapped in the snow with them, tearful when Mary lost her sight, and because I was still a kid back then, I didn't really understand the part she fell in love with Almanzo Wilder. My teacher gave these to me in first grade. She was impressed that I had taught myself how to read and I was such a well spoken child at an early age. What went wrong with me? Well these books are an all time classic. I remember staying up all night reading the stories with the blanket over my head and my brothers flashlight shining on the pages. They kept me up all night and I so miss the books, the movies, but even more so the morality that was so simple and logical that it makes me stop wonder My teacher gave these to me in first grade. She was impressed that I had taught myself how to read and I was such a well spoken child at an early age. What went wrong with me? The first book and a couple after were read aloud to my class in third grade by my wonderful teacher, Miss Genevieve Emrich. Truly a childhood classic, even though I have read a lot of criticism of the series in my years teaching children's literature. At the time, it was magical. These books were the best i ever read! LOVE THEM!!! they are awesome! I haven't read this series in decades, and yet I still remember so much. I should do a reread over the summer. Sweet and ideal, but shockingly real in some ways. Here we were discussing the Little House on the Prairie books and she’d ended the conversation with that dyspeptic remark. I stood staring at her. What was she saying, my dear mother, who had always been the practical bystander? She’d tell me as a child, “You know, life’s pretty boring most of the time.” No doubt, she’d glimpsed the kaleidoscope of stars in my eyes at the time and sought to bring my feet back onto solid ground. So although her remark was most likely innocuous, I still felt some of that old resentment as if she was still trying to break me from my whimsical childhood dreams. To the average Joe, the fact I hadn’t come to grips with the probability that Laura’s books were a bit embellished might seem utterly ridiculous. But I hadn’t really thought about it. And here I was in my late thirties, it wasn’t as if I was ten and my mom had just told me Santa wasn’t real. As a child, I’d lived amid reality and fiction- passing between them like crossing a border between two hostile countries. I remember watching D.A.R.Y.L. at the Scera Theater during the summer of 1986. When the red curtain closed on the screen (yes, there was a curtain in those days) I could hardly stand up and process the kids laughing, throwing wrappers, and moving out into the sunshine. Riding home in the yellow station wagon, my heart thumped with the story. He was really a robot! I mean all along! When they were playing baseball or eating sandwiches at the kitchen table, when his adopted family was falling in love with him- all along he was really a robot with a human body. Somehow his artificialness had evolved and he ended up with feelings! Love and anger and fear (which incidentally was the reason the government deemed him a failure.) It was all so breathlessly heady for my twelve-year-old mind. I was obsessed with it for days. Such an obsession bewildered my thoughts and crept under my skin until I no longer felt solid or tame. I never wanted my children to lose their sense of wonder, but on the other hand, I did not want them traumatized at twelve by The Temple of Doom watched, with wide and blanketed eyes, at a church sleepover. Or fall in love with the lead actor of the local play so that the curtain call produced such yearning and angst. In junior high, my obsession with The Outsiders by S.E. Hinton manifested itself in the large sections of my journal filled with copied quotes from the book along with my devoted teenage commentary. We watched the movie in English class and when Johnny died in the hospital after saving the kids from the church fire, I could barely eat my lunch at the white tables in the cafeteria. My friend asked what was wrong. “Johnny died.” I choked out. She looked at me funny. I looked at her in astonishment. How was that possible? How could she not feel the throes of Johnny’s death? It felt as if she’d thrown the burning timber that killed that cute-young-karate-kid. In my early twenties, right after my heart had been so thoroughly broken I could barely get out of bed, I looked at the world in foggy agony and attempted to shed my “carried-away-ness.” I started fighting to keep a level head so I could manage adulthood. I had choices! Things just didn’t “happen” to me without any responsibility on my part. Maybe a lot of my fantasy thinking as a kid was normal but I wasn’t sure it was healthy. Learn to deal with disappointment and boredom. My mother’s voice became my own. So with all my current level-headedness, I was surprised when my mother’s offhanded comment backfired. Why hadn’t I considered the possibility that the Little House series might be gussied up a bit? Why had I clung onto this little piece of nostalgia? What made this series different than Narnia or Hobbits or mad wives in the attics? Why did I not roll my jaded eyes at the “clean wood” and “fresh curtains” and the bow crossing Pa’s fiddle at the speed of light? On further pondering, I wondered if my reaction to my mom’s comment was in part because I was led to believe or perhaps just assumed that the books were full- throated and deliciously true. Every word. Sure, it was a bit confusing for Laura to use the third person instead of “I looked deep down into the blackness of that little baby’s eyes, and I wanted that one little baby.” There seemed a distance to it as if Laura was watching herself move and run through the prairie grass. Yet, I believed the truth of it. Of every honey-colored vanity cake and pink-edged curtain. I believed in the goodness of the family, the coziness of the red checkered tablecloth and the luminous hearth whether it was a stone chimney or the shiny black cook stove given to Ma as a present from Pa. As much as I loved Narnia or the Shire, I knew of their pretendness, their purple-tinged existence. No wardrobe on earth led to a place where ordinary girls and boys became queens and kings. But the places the Ingalls lived existed on the planet. Wisconsin. Minnesota. North Dakota. And there once lived on this earth a girl named Laura Ingalls. As usual, my mother was probably right. Domestic life back in the day might not be quite that cozy or cornucopia. Nevertheless, I worked out my own personal truths about the Little House Books and why the stories live in my blood. It’s my way of making peace with yet another childhood relic facing the wrath of actuality. Truth #1. Christmas is always better in a log cabin on the prairie when you have nothing. Remember Mr. Edwards crossing the wild creek to bring the Christmas presents from Santa Claus? Remember the new tin cup, the stick of peppermint candy, a heart-shaped cake? Remember Ma asking them if their stockings were empty? Let’s face it, if you’re ecstatic about receiving a penny, albeit a shiny penny, you live in an entirely different universe than the one today with expectant kids opening smart phones, x-box machines, and six hundred piece Lego sets. Christmas on the frontier lacked frantic materialism. Laura understood at a very basic level the difference between nothing and something, between molasses and white sugar, between poverty and a penny. In each book, Christmas is always a monumental event usually with its own chapter that never fails to create a sort of pithy yearning in the modern reader. The chapter usually includes such details as Pa whittling flowers and birds into a wood bracket for Ma, Laura receiving Charlotte her first rag doll, the aforementioned pennies, the Boasts showing up on Christmas Eve at Silver Lake, the secret makings of mittens, neckties, aprons, and handkerchiefs knitted of thin lawn, the Youth’s Companions saved to read on Christmas day, cans of oysters which apparently were quite a treat, popped kernels, Almanzo coming from Minnesota with oranges, and my favorite- the Christmas tree at the church with the little fur cape and muff saved for Laura. The very fur cape and muff that upstage the infamous Nellie Oleson. Oh to be content with a penny of your very own! To have a moment fully realized, to yearn for nothing else. For sheer joy to wash down to your bones. To be content with a one room cabin, Pa-made furniture, and white sugar only when company came. To find your true gifts in the natural world: The rippling grass and enormous sky. The plum thickets and cattle paths. The sheet of silver water and tall wild grass of Silver Lake. The tangles of wild grapevines and wind blowing through the cottonwoods. Gifts savored with appetites void of distractions, without the clutter of too many presents under the tree. Truth #2- Don’t believe everything you read about Pa. I love Pa. I might have even been in love with him at some point with his wild hair and fiddle playing and his “Where’s my little half-pint of sweet cider half drunk up?” Seriously, Pa could do anything. Build a log cabin, fashion furniture from trees, dig a well, construct a fish trap with scraps of wood, twist hay into sticks for burning, follow the clothesline to the stable to feed the livestock during a blizzard, cross a roaring creek, outsmart a pack of wolves, survive for three days in a snow bank during a blizzard, play the fiddle like a choke cherry tree quivering in the wind, melt lead to make bullets, kill animals to feed his family, build the rocking chair of all rocking chairs for Ma, win the town spelling bee, trap and skin animals, plow a wheat field, plow a corn field, save the house from a prairie fire. However, on the internet, there are certain innuendos about Pa. Quite a few bloggers attribute the family’s several moves and financial loses as proof that Pa was either a good-for-nothing lazybones or an opportunist charlatan. “So in reality, Pa ends up being rather a jerk,” one blogger opined. Be still my heart. If Pa wasn’t a decent, hard-working guy wouldn’t the entire premise of the stories falls apart? In the books, there is always a really good reason for the moving ons and starting overs and Laura certainly didn’t seem to mind them since she personified wanderlust. In the big woods, the land was settling up and food was becoming scarce. No more bears and deer meat to survive those long winter months. The Indians and the government drove them from the little house on the prairie. And surely Pa couldn’t be held responsible for the plague of grasshoppers that devoured his wheat crop on the very eve of harvest while they lived on the banks of Plum Creek. Later, the long winter stalled their homestead progress and blackbirds ate the corn. But apparently two girls of his did do exactly that while he was alive and kicking. Truth #3- I was born in the wrong era. Yep, I mean it. I’m sticking to it. The Little House books have always created a sense of longing in me (and countless other little girls) to live in a log house. And even as an adult, I still wonder if I’ve been cheated by being born into this techno-crazy world. Sure life was hard back then and the thought of an unheated house, baths only once a week and untreatable malaria hardly sounds like a vacation. Still, they had roasted pig’s tail and country dances and buggy-rides! Despite the abundant amount of information at our fingertips today, there seems a lack of critical thinking, a lack of wisdom. No one I know, including myself, can divide sums without a calculator or recite from memory the entire American history like Laura did at the school exhibition. In actuality, I’m sure the Ingalls found plenty of tedious moments. For instance, we never hear about the outhouse situation in the little books. Wouldn’t that have caused some serious headache during one of those three day blizzards? And how much of their life was spent fetching water, kneading dough, washing dishes, sewing even stitches on a bodice? Most of their time and energy was spent on providing shelter, warmth, food and clothing. But for me, this single-mindedness is the appeal. There is no therapy like work. They didn’t have time to wonder how their parents ruined their childhood or if they should vaccinate their children or if the food they ate caused cancer. (Although, Ma did believe watermelon caused Fever’n’ague. Pa ate an entire one by himself anyway.) Mostly, they were grateful for food even if it was blackbird pie. Out on the prairie or in the little town, strangers aided each other in times of illness or distress. People needed each other for survival. I wonder if their perspective focused more on the eternal because death lurked in the corner. Although I’d never say their lives were easier or even simpler, I do believe the reality of their situation forced them to face the bigger questions more often. They dug to the roots of life more often because they had fewer distractions obscuring their view like overgrown ivy. For some reason that sounds mighty appealing to me. Truth #4- A fictional story is no less beneficial and authentic than a true story. I think I came to this conclusion early in life, growing up on Narnia and Nancy Drew and Beverly Cleary. Then came Jane Eyre and My Name is Asher Lev and Housekeeping. All books that expanded and latticed my life with beauty. Yet in society, there is generally greater value placed on a true story than on a fictional one. Ask James Frey. A friend once told me she couldn’t justify reading fiction because she wasn’t learning anything. Apparently, fiction equates a lack of truth. In this vein, Laura and her daughter Rose took great pains to assert that every word of the books were true, thus creating the controversy when facts proved otherwise. Yet stories, true or not, live in our blood and give meaning to our lives. Some of the greatest lessons are taught through fiction. Jesus himself taught eternal truths through parables. I’ve come to the conclusion that it doesn’t matter to me whether every word in the Little House books reflects reality. Maybe it was never the “true” aspect of Little House that bewitched me. Maybe it was the way the books carried me out of the real world and into another “real” world that just might exist because this Laura person really did exist. The stories have become a part of me, as real as a childhood memory. They vibrate in my background like the wind chimes on my front porch. The idea of the log cabin made with Pa’s bare hands (and Ma’s until she sprained her ankle) still tangle up around me like wisteria. A few years ago, I rented D.A.R.Y.L. mostly out of curiosity- to see what the big fuss had been. This time around, the movie generated no obsession, not even charm. Just another cheesy 1980s production. My kids, accustomed to digital-lightsaber-fights, didn’t think much of it either. Even reading the Outsiders again, although poignant, reminded me a little too much of junior high. With Little House, though, I still find some sort of hoary comfort from reading about maple dripping from trees and squash stacked up in the attic. The stories are rustic safe. My mom was really questioning if lives could flow so much like rich purple cashmere. It wasn’t that the Ingalls didn’t experience hard times, it was that those stories seem to unfold and move beneath a safe paraffin-like surface. A surface not unlike the glossy pages in the full-colored collector’s set. Nothing scratching their beauty. No matter how many grasshoppers ate the wheat or how many blizzards attacked the house or how many times Nellie called Mary and Laura “country girls,” Ma was always home cooking her baked beans and no yeast bread and Pa’s gun hung over the doorway on two wooden pegs. Oh, to play catch with a pig’s bladder! To wear a brown poplin to church (and have a cat climb up your hoops) or slide on the ice of Silver Lake and escape the wolves. To sleep in a hay ticked bed. To be thrilled with syrup squiggles in the snow or to wade in a creek with the water-bugs. To draw a dripping bucket of cold, fresh water from the well. To look through an open window at a pack of wolves. To slide down a golden straw-stack or gallop across the land clutching handfuls of a pony’s mane. To hear the horse bells in the frigid air coming to take you away from the horrid Mrs. These books were such a good diversion for me as a young child. I was Heidi in 3rd grade and then Laura in 4th. I loved them all. I know they aren't literary greats and there is some stretching of truth... but they were so important to me growing up. 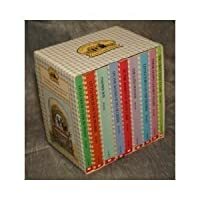 I love each of these books written by Laura Ingalls Wilder. I am continuing to read related books by other authors as I am studying what characteristics made up the American Spirit during the great expansion when Americans were Homesteading and during the years following. I was very impressed with the attitudes and character of each member of the Ingalls family and of Almanzo Wilder. They had a love of family and of God. They believed in being their best no matter what was happening in their liv I love each of these books written by Laura Ingalls Wilder. I am continuing to read related books by other authors as I am studying what characteristics made up the American Spirit during the great expansion when Americans were Homesteading and during the years following. I was very impressed with the attitudes and character of each member of the Ingalls family and of Almanzo Wilder. They had a love of family and of God. They believed in being their best no matter what was happening in their lives. They faced challenges with courage. They were very highly skilled in things I come nowhere close to in my life, such as home building, sewing, keeping a clean and comfortable home at all times even in the midst of chaos. They cheerfully disciplined themselves to work together as a family and achieve their goals together, and then if things did not work out as they hoped, they picked up where they left off and cheerfully started all over again. They were thrifty, knowing how to make a small amount of household resources go a long way. The children were in a real sense apprentices of their parents so that when they began their own lives on their own or with their own families they were highly skilled to do so. The Ingalls girls were far better educated with or without a high school diploma than I am with a high school diploma, knowing the history of the US and of the explorations that lead to the founding of the US very well, being able to diagram sentences, having memorized the entire Declaration of Independence, and having memorized the entire book of Psalms among other Bible verses. I identified with Laura in her love of the outdoors, in her playful spirit, in her love of flowers, in her love of faith and family, and in her determined attitude to achieve goals. I find myself different than her in my handling of life's difficulties, not being as courageous and thankful as her and wanting to become courageous and thankful. I am also different in being much more of a romantic than her in courtship and marriage, but I am like her in being a close friend and partner with my husband. She was more willing to tackle tasks considered a man's realm than I am, such as cutting down trees, and making fuel for the fire. She was a harder worker and a faster worker than I am and I would like to become as dedicated and skilled at my work as she was with hers.